For years, companies exploited a financial accounting loophole by structuring lease transactions so they could account for them as operating leases. This let them avoid having to recognize a lease liability on the balance sheet, thus hiding the debt. Statement of Financial Accounting Standards (SFAS) No. 13, Accounting for Leases, only required entities with capital leases to report a lease liability and asset on the balance sheet. 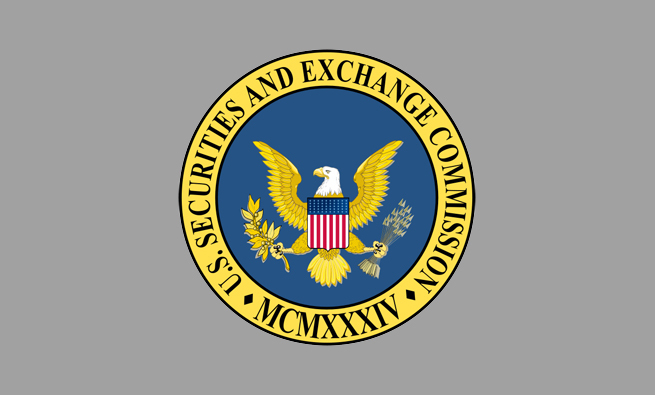 But in February 2015 the Financial Accounting Standards Board (FASB) released Accounting Standards Update (ASU) 2016-02, amending FASB Accounting Standards Codification® (ASC) Topic 842, Leases. The long-anticipated new lease accounting standard is the product of a decade-long joint project of the FASB and the International Accounting Standards Board (IASB) aimed at increasing the relevance and faithful representation of financial reporting for lease transactions. This new leasing standard snatches away debt’s old hiding place for any leases longer than a year. It removes the bright-line lease classification criteria that companies used to avoid capitalization of leases and turns any attempt to hide lease liabilities off the balance sheet into a futile exercise. 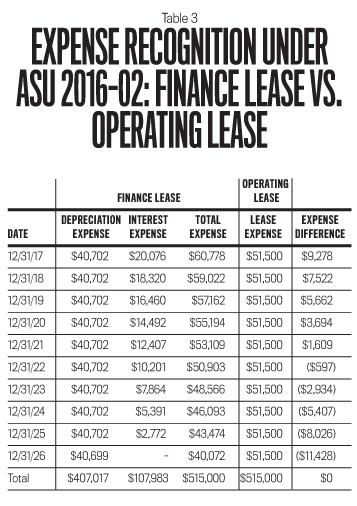 The new ASU requires lessees to recognize assets and liabilities for virtually all finance (known as capital leases in SFAS No. 13) and operating leases. 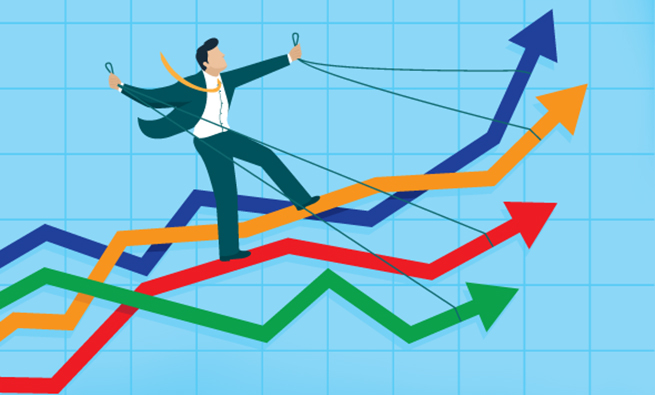 The new standard is likely a breath of fresh air for investors and creditors, who suffered from a lack of financial reporting transparency and comparability because of the flaw in SFAS No. 13. CFOs will have to adjust to the changes in the leasing rules (see “7 Key Changes”). The FASB issued SFAS No. 13 in 1976 intending to make companies account for lease transactions on the basis of their economic substance rather than the legal form of the transaction. Unfortunately, lessees and creative lessors developed a cottage industry where lessees could easily acquire financed assets and avoid recognition of the lease liability on the balance sheet. 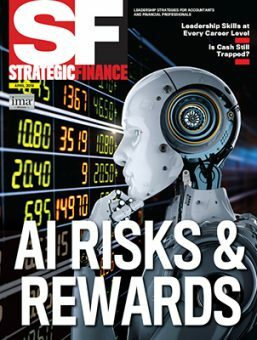 Transactions were routinely structured around SFAS No. 13’s lease classification criteria to ensure the lease would be accounted for as an operating lease. 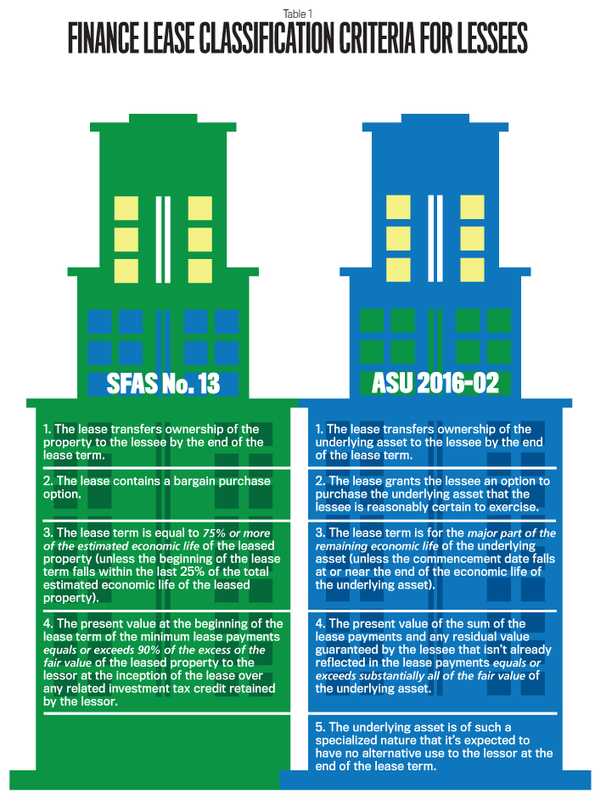 Table 1 compares the criteria for classifying a lease as a finance (i.e., capital) lease under SFAS No. 13 vs. ASU 2016-02. Under either guidance, a lease is classified as a finance lease if it meets at least one criterion listed for that guidance. The new standard basically adopts the four classification criteria under SFAS No. 13 and simply replaces the bright-line tests—based on specific numerical values—with qualitative parameters. In addition, the new standard adds a fifth criterion that mandates lease capitalization for specialized assets that would have no alternative use to the lessor at the conclusion of the lease. At first glance, the new standard isn’t much different. Despite the elimination of the bright-line tests in the capitalization criteria, it seems that lessees could easily continue to structure most lease transactions to qualify as an operating lease. For example, under SFAS No. 13, the two most stringent finance lease criteria relate to the lease term and the present value of the minimum lease payments. The new standard replaces the lease term bright-line language of “75% or more of the estimated economic life” with “the major part of the remaining economic life.” Similarly, the present value of the lease payments criterion in SFAS No. 13—“equals or exceeds 90%” of the fair value of the leased asset—has been replaced with “equals or exceeds substantially all” of the fair value of the leased asset. But in ASU 2016-02, the FASB explains that one reasonable application of the lease classification guidance is that 75% or greater is a “major part” of the remaining economic life of an underlying asset and that 90% or greater is “substantially all” the fair value of the underlying asset. The FASB acknowledges that this largely retains some, but not all, of the bright lines in the previous Generally Accepted Accounting Principles (GAAP) lease classification test. But now those bright lines aren’t mandated. In addition, some criticism of the previous bright-line thresholds will probably ease because almost all leases are now required to be recognized on the balance sheet. The only exception will be short-term leases for which a lessee elects the recognition and measurement exemption. 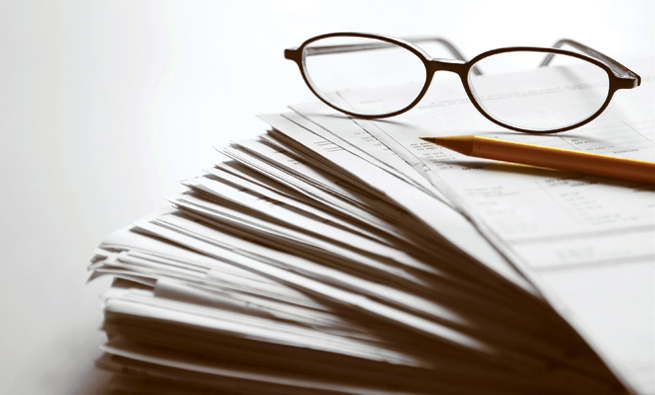 Despite the similarities to the old guidance, investors and creditors yearning for increased transparency in financial reporting shouldn’t despair. The FASB devised a very clever provision to eliminate off-balance-sheet financing for lease transactions. Under the new standard, companies must recognize on their balance sheet a right-of-use asset (an asset that represents a lessee’s right to use an underlying asset for the lease term) and a liability for all finance leases and most operating leases. 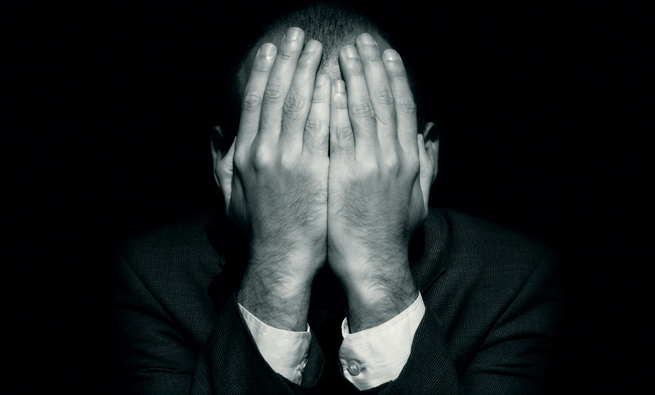 Most companies will no longer be able to hide debt by leaving a liability off the balance sheet. Only short-term leases of less than 12 months can avoid liability recognition on the balance sheet. In addition, a lease that contains an option to purchase the underlying asset that the lessee is reasonably certain to exercise isn’t considered a short-term lease. The new standard also affects the way lease expenses are recognized on the income statement. Similar to the treatment in SFAS No. 13, companies with operating leases recognize a constant, single lease expense each period. But the difference is that this single amount is allocated to interest expense and depreciation expense so the book value of the right-of-use asset can be measured and reported each period. Under the effective interest method, interest is calculated and accrued each period by multiplying the discount rate that was used to measure the initial lease liability times the book value of the liability at the beginning of the period (see Table 2). While interest expense declines under the effective interest method as the liability is reduced, depreciation expense increases by the same amount to maintain a fixed, single operating lease expense each period. Companies with finance leases continue to recognize interest expense and depreciation expense similar to the situation under SFAS No. 13. 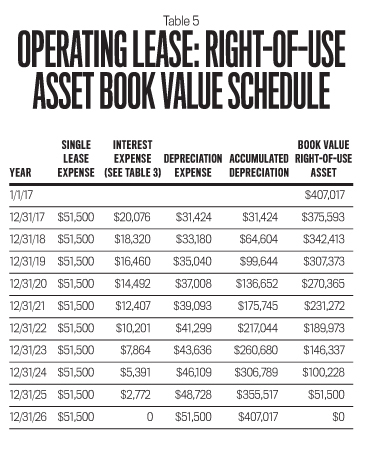 Although the total expense recognized over the life of a lease is the same amount whether the lease is accounted for as a finance lease or an operating lease, companies with finance leases recognize higher expense amounts in the early years of the lease (see Table 3). Therefore, finance leases front-load lease expense recognition compared to the constant, single expense recognized for operating leases. Interest expense for a finance lease is calculated using the effective interest method, and depreciation expense is typically measured using straight-line depreciation. RTR Corporation signs a 10-year lease of an asset to begin on January 1, 2017, with an option to extend the lease for an additional five years. Lease payments will be $50,000 per year during the initial term and $55,000 per year during the optional period, all payable at the beginning of each year. RTR incurs initial direct costs of $15,000. Due to market conditions, the lessor doesn’t offer a lease incentive. At the lease’s commencement date, RTR isn’t reasonably certain that it will exercise the option to extend the lease, so it determines the lease term to be 10 years. If there is insufficient detail provided in the lease contract, the implicit rate would be indeterminable. For example, if you signed a contract to lease a car and the car dealer told you the payments would be $599 per month for 36 months, you wouldn’t be able to determine the implicit rate used in the lease to calculate the lease payments unless you know the residual value of the car that the dealer expects to recoup at the end of the lease. In RTR’s case, the rate implicit in the lease isn’t readily determinable, and RTR’s incremental borrowing rate is 5.87%. At the commencement date, RTR will make the lease payment for the first year and will incur the initial direct costs. Initial lease liability: At the commencement date, RTR will measure the initial lease liability as the present value of the remaining nine payments of $50,000 discounted at the rate of 5.87%. The present value is $342,017, resulting in an initial lease liability of $342,017. 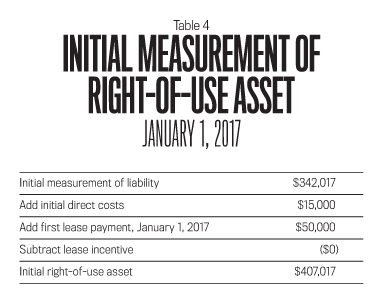 Initial right-of-use asset: Also at the commencement date, RTR will measure the initial right-of-use asset of $407,017 (see the calculation in Table 4, which covers the initial measurement of the right-to-use asset). Finance lease expense recognition: During 2017, RTR will recognize lease interest expense and depreciation expense. The lease liability is amortized in accordance with the effective interest method shown in the amortization schedule in Table 2. Therefore, in 2017 RTR recognizes interest expense of $20,076. RTR depreciates the right-of-use asset on a straight-line basis over the 10-year lease term in the amount of $40,702 ($407,017 / 10). Subsequent liability measurement: The carrying amount of the liability in subsequent periods equals the present value of the remaining lease payments at that point in time. 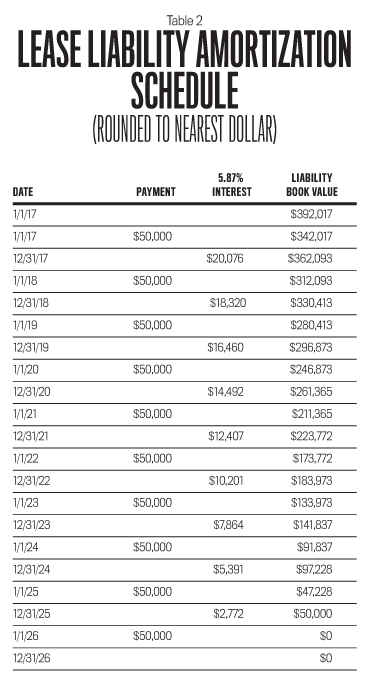 The easiest way to calculate this amount is to use an effective interest liability amortization schedule (like Table 2). On December 31, 2017, the carrying amount of RTR’s lease liability will be $362,093. Subsequent right-of-use asset measurement: The carrying amount of the asset at any point in time equals its initial measurement minus its accumulated depreciation. On December 31, 2017, the carrying amount of the right-of-use asset will be $366,315 ($407,017 – $40,702). Now assume that RTR Corporation classifies the lease as an operating lease instead. Let’s see how the numbers would look. Initial asset and liability measurement: In spite of the classification as an operating lease, RTR would recognize a right-of-use asset and a liability under the updated standard. The measurement of the initial asset and liability for the operating lease is identical to the procedure in the finance lease example. Therefore, RTR will measure an initial lease liability of $342,017 and an initial right-of-use asset of $407,017. Single operating lease expense recognition: Operating lease expense is recognized as a single, straight-line amount over the term of the lease. It’s calculated by straight-line amortizing the total cost of the lease over the lease term. The total cost of the lease is $515,000, measured as the nondiscounted sum of the 10 lease payments of $50,000 each plus initial direct costs of $15,000. So for each year of the 10-year lease, the single operating lease expense is $51,500 ($515,000 / 10 years). As with the finance lease, interest expense for the operating lease is calculated using the effective interest method shown in Table 2. But depreciation expense for an operating lease is calculated each period as the residual amount after deducting the interest expense for the period from the single operating lease expense (see Table 5). For example, in 2017 RTR would depreciate the right-of-use asset $31,424 ($51,500 single lease expense minus $20,076 interest expense). Depreciation actually increases each period because interest expense declines every period as the liability balance declines. This is highly unusual as depreciation is typically measured using either straight-line depreciation or an accelerated method that reports declining depreciation amounts each period. Nevertheless, depreciation expense in an operating lease is used only to determine the book value of the right-of-use asset. Depreciation isn’t reported separately on the income statement because operating leases involve simply reporting a single operating lease expense. Each period, RTR must report the remaining book value of the right-of-use asset and the lease liability, either on its statement of financial position or in the notes. Let’s examine how to do the required measurements for an operating lease. Subsequent liability measurement: The carrying amount of the liability in subsequent periods equals the present value of the remaining lease payments at that point in time. It’s calculated just as it was calculated for the finance lease, as shown in Table 2. The expense recognition schedule in Table 3 compares the lease expense recognition for a finance lease vs. an operating lease under the updated leasing standard. Although the total lease expense over the life of the lease is $515,000 for both types of lease, the finance lease front-loads expense recognition in the early years of the lease, similar to the situation under SFAS No. 13. For public companies, the new accounting guidance is effective for fiscal years beginning after December 15, 2018, including interim periods within those fiscal years. Early adoption is permitted. For leases that start before the new standard’s effective date, lessees have the option to continue using previous GAAP in accounting unless the lease is modified. 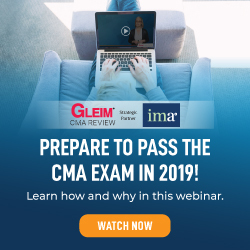 But companies electing this practical expedient option must recognize a right-of-use asset and a lease liability for all operating leases at each reporting date—based on the present value of the remaining minimum rental payments disclosed under previous GAAP. Although the new standard eliminates bright-line lease classification criteria, it still provides enough flexibility to structure lease transactions in a way to achieve classification as an operating lease. But as we have seen, the new standard requires recognition of a lease liability and right-of-use asset for all operating and finance leases with lease terms greater than 12 months. The new standard especially affects accounting for operating leases. 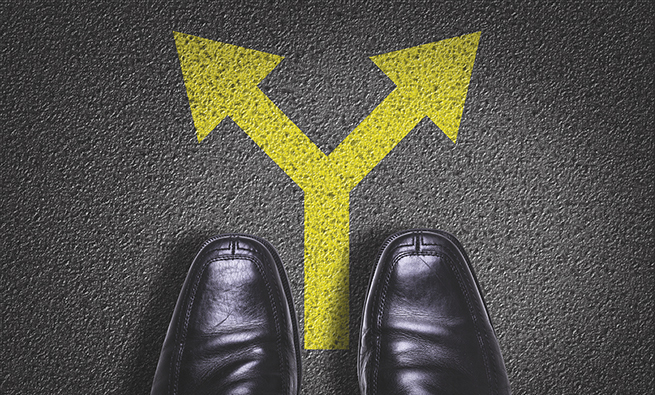 In spite of reporting a fixed, single lease expense each period, measurement of that expense—and the subsequent book value measurement of the right-of-use asset—follows a unique and unusual path. For example, in this article I’ve shown that under the updated standard, depreciation increases each period because it represents the residual amount after deducting interest expense from the fixed, single operating lease expense. Lessees must carefully evaluate the impact of the accounting change. A substantial increase in reported liabilities could increase the cost and/or difficulty of financing future capital asset acquisitions—whether they are obtained using a lease or by traditional financing arrangements. C. Terry Grant, CPA, Ph.D., is professor of accounting at Mitchell College of Business, University of South Alabama, in Mobile, Ala. You can contact him at (251) 461-1755 or tgrant@southalabama.edu.